Attorney Jon E. Krupnick was born on March 17, 1940, in Cleveland, Ohio. He graduated from Lehigh University in 1962 and the University of Notre Dame Law School in 1965. 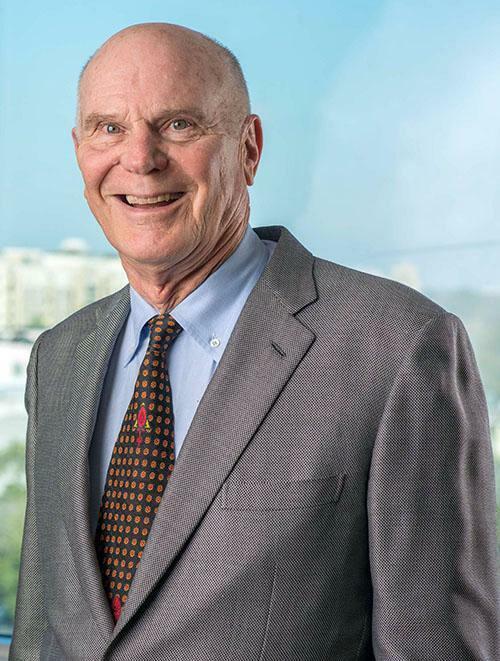 In 1967, he started his legal career in Florida as a member of an insurance defense firm and by 1974, Jon founded this personal injury law firm in Fort Lauderdale, dedicated solely to the representationof injured persons. Skip Campbell became the first lawyer Jon hired, and then, in 1975, the firm became known as Krupnick & Campbell. Jon is admitted to practice in Florida and Ohio. He is also admitted to practice before the United States District Court for the Southern District of Florida, the United States Court of Appeal for the Fifth Circuit, and the United States Supreme Court. Jon is also actively involved as a member of the College of Diplomates of the Academy of Florida Trial Lawyers. He is a sustaining member of the Association of Trial Lawyers of America and past president of the Broward County Trial Lawyers' Association. He has also served as an adjunct lecturer at Nova Southeastern University Shepard Broad Law Center and at his alma mater, Notre Dame Law School. Each year Notre Dame presents an award in Jon's name to the school's outstanding student in trial advocacy. Jon has developed recognition and a reputation as one of the premier and most innovative trial lawyers in the United States. Jon has personally obtained more than 135 verdicts and settlements in excess of one million dollars. In 1983 he received what was then the largest personal injury verdict in the country for a single claimant when the jury awarded $16.5 million in an automobile product defect case. In 1983, Jon became one of the first attorneys in Florida to become board-certified as a Civil Trial Attorney. Jon has consistently been AV rated by the Martindale-Hubbell Law Directory, which is the highest rating given by this publication. In 1988, he was selected to be included in the book, The Best Lawyers in America. In 1995, Forbes Magazine listed Jon as one of the ten most successful attorneys in America. Jon has also been appointed as the only trial attorney to the Founding Board of the American Medical Association's National Patient Safety Foundation. In 1997, after months of trial representing a young man who tragically lost his arm in a wood chipper resulting in a verdict of $8.1 million, Jon ventured into authoring and publishing a successful book entitled Pan American Pacific Pioneers – A Pictorial History of Pan Am's Pacific Flights 1935-1946. This culminated Jon's lifelong fascination and passion for the Pan Am Pacific flights which began in his childhood. Jon has also had extensive charitable and community involvement with numerous organizations including the Boys & Girls Clubs of Broward County, the Covenant House, the Broward Community Foundation, Kids in Distress, and the Cleveland Clinic Foundation. Jon has also been a leader in the fund-raising efforts of the Miami Project for their research to find a cure for spinal-cord injury and paralysis.